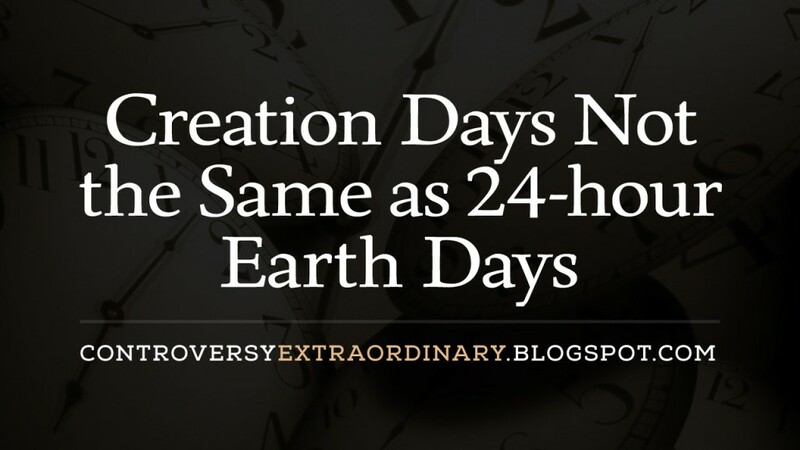 Creation Days Not the Same as 24-hour Earth Days: Click here for the third part of this blog. Getting our parameters right begins with knowing beginnings, but more than that is being able to distinguish one beginning from the other. Most think that Day 1 of Creation is also Day 1 on Earth. The Bible explains that these two differ. It is on the fourth day of creation that the first earth day commenced. The doubt that we have to solve is how vegetation could exist when the sun was made to bring light unto the earth only on the fourth day. It is scientific knowledge that vegetation can exist for some time without the light of the sun upon which plants depend to produce their food by the process of photosynthesis. We must remember that it was on the third day of creation that God caused the appearing of dry land from the globe of waters, after which He caused vegetation to appear. From these accounts, we understand that two great parts of creation happened on the third day: the appearing of the ground or the dry land, afterwards the appearing of vegetation. This is wonderfully scientific considering that the book of Genesis was written less than four thousand years ago, when people could hardly understand that vegetation is necessary to hold soil on its place and to prevent erosion! But the doubt is focused on this: why was the sun necessary for plant life made only the following day which is the fourth day? As I mentioned earlier, there are plants that can exist for some time even without sunlight. The possibility is that since vegetation and plant life were created at the end of the third day (of Creation), the sun was made to shine immediately at the start of the fourth day (Day 1 for Earth). This solves the scientific problem involved! While it is true that the bud of a seed that grows tend to the direction of light, it is also true that the budding process can start without light. A seed planted below the surface of the soil where there is no light will grow. This will clearly erase the doubt in the mind of one who understands the truth in the Bible and in science, but certainly will be questioned by scoffers! We must also consider that when God said, “Let the earth bring forth grass,” he did not say “Let the dry land bring forth grass.” When God said, “Let the earth bring forth grass,” he meant the ground in dry land and the ground under the sea to bring forth plant life. It is worthwhile mentioning that “grass” – the plant life in the depths of the sea sustain most of marine creatures. The earliest evidence of land plants and fungi appears in the fossil record around 480 million years ago. Before that, the Earth’s landscape was believed to consist of barren rocks, home to bacteria and possibly some algae. But some have argued that it is quite possible for land-dwelling plants and fungi to have been around much earlier, but their primitive bodies were too soft to be preserved as fossils in rock. (http://news.bbc.co.uk/1/hi/sci/tech/1482382.stm). Science affirms – as do atheists guess – that marine life existed before land life. Richard Dawkins wrote that, being land-oriented now, one day he will go back to the sea. Dawkins is a British evolutionary biologist. The move from water to land launched a major redesign of every aspect of life, from breathing to reproduction: it was a great trek through biological space. Nevertheless, with what seems almost wanton perversity, a good number of thoroughgoing land animals later turned around, abandoned their hard-earned terrestrial retooling, and trooped back into the water again. Seals and sea lions have only gone part-way back. (The Greatest Show on Earth by Richard Dawkins, Page 80). Note that marine life were brought forth first then land life. Animals like cattle and creeping things were made by God at the dawn of the sixth day of creation and humans towards the end of the sixth day. (Creeping things are on dry land, not in the sea). This allows millions of years of animal existence before mankind. This also solves doubt about the existence of dinosaurs millions of years before mankind! A day in creation is not a 24-hour day as other Bible apologists claim! The earth was not brought forth in one (1) earth-day! The First to the Fourth day of Creation happened before the sun was made to shine in the dome of the sky to light the earth, determining how an earth-day is made! This is Part 4 of Possibilities and Impossibilities in the Bible.